Agreeably it's a beautiful philosophy and thats what caught our attention when we got to know that husband wife duo Prabhas and PAllavi worked around this same philosophy to start their maiden Cafe venture, 'Hakuna Matata', in swahili which means 'No Worries'. So on a bright weekday afternoon I and my fellow KFBian Amrita headed to the city's newest vegetarian fusion cafe. Like it's unconventional name everything here has that touch of innovation. The first thing that will catch your attention is their eye for details, each and every place and corner is decorated keeping in mind the theme and every minute details. 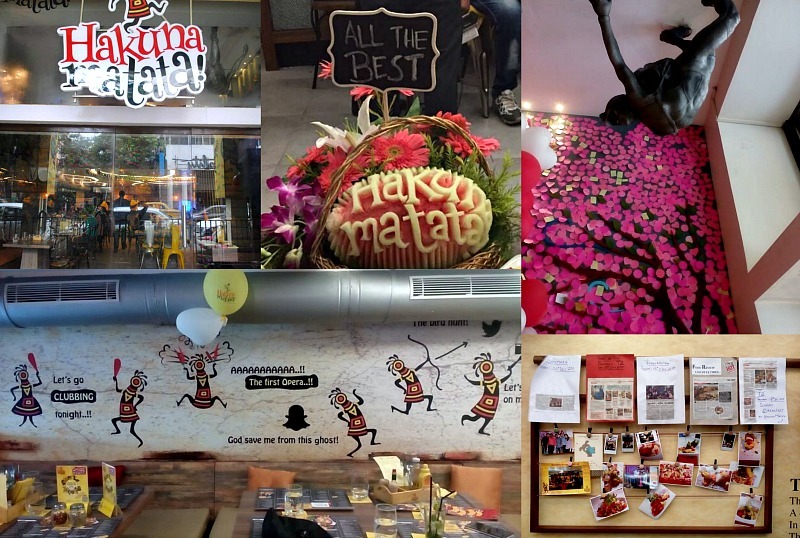 From decor to food to their way how they try to keep the customers engaged all the time tells a story of people who are truly passionate about this venture and are fascinated with this journey. The maskot KOKO another Swahili motif was named through a contest by one of their customers and they take immense pride in the wish tree which is growing big and big with time. The decor is bright and mostly in a cheery yellow colour signifying the young minds and the experiments which is a big part of the whole venture. The painting on the wall depicts Koko's journey who rides a bicycle to travel the World and bring in tips and recipes to give variation to the menu. From the every growing wishing tree to the suspended figurines from the ceiling all depict the philosophy of exploration and celebration of everyday life. Keeping in mind the local flavours the decor is done by Kolkata based sculptors and artisans. Apart from the catchy name the food here is different too, yes in a non vegetarian loving Bengali city it needs a lot of conviction to start a Pure vegetarian fusion cuisine Cafe. 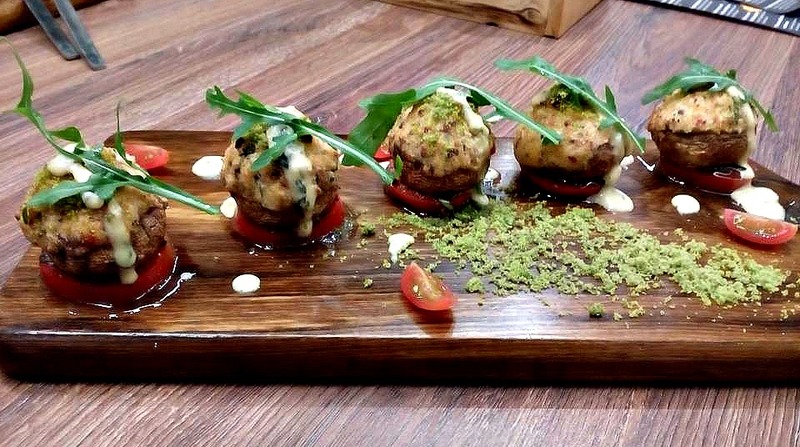 We have tasted Chef Chanchal's food earlier and we had full faith in his abilities and to add to that the menu looked awesome. Truly speaking it was a vegetarian's paradise. They even have dishes keeping in mind the special diet restriction of the jains that is without any underground veggies. They also keep changing the menu matching the very essence of each and every festivities in the town. So when Valentine's day menu comes with chocolate stuffed falafel and choco lava cake The puja menu brings in the Bengali flavour in terms of Daler bbora and all. Keeping in mind the craze for Pizza and Pasta they have creaed a menu where customers can make their own pizza with different sauces and toppings. They recently got their liquor licence and are planning to launch an exclusive menu for cocktails. We started with a beautiful warm Chinese salad which could be best described as food art. 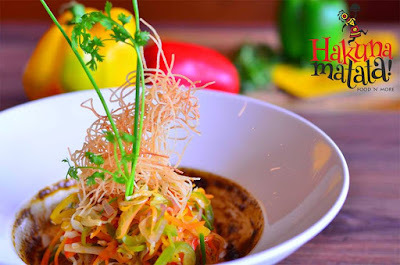 The Crispy fried noodles provided a beautiful textural background to the wonderfully warm salad that comes with it's own house made sauce.This was a great start to the whole gastronomic experience. Next was the Chocolate stuffed falafel, Beetroot hummus on a bed of couscous salad. We were quite skeptical about this dish but Chef combined the two components so well that it instantly became our favourite. Being an ardent fan of Polenta, the next dish stole the show for me. The polenta stuffed baked mushrooms, drizzled with herbed cheese dip, sliced tomatoes and herbed breadcrumb did not only smelled and looked good but also had a melt in the mouth consistency. The Herbs for the breadcrumbs are locally sourced so are many of their ingredients. The last dish fused Indian flavours with Middle Eastern concepts brilliantly. The India inspired Mezze platter was a treat to look at and sample. 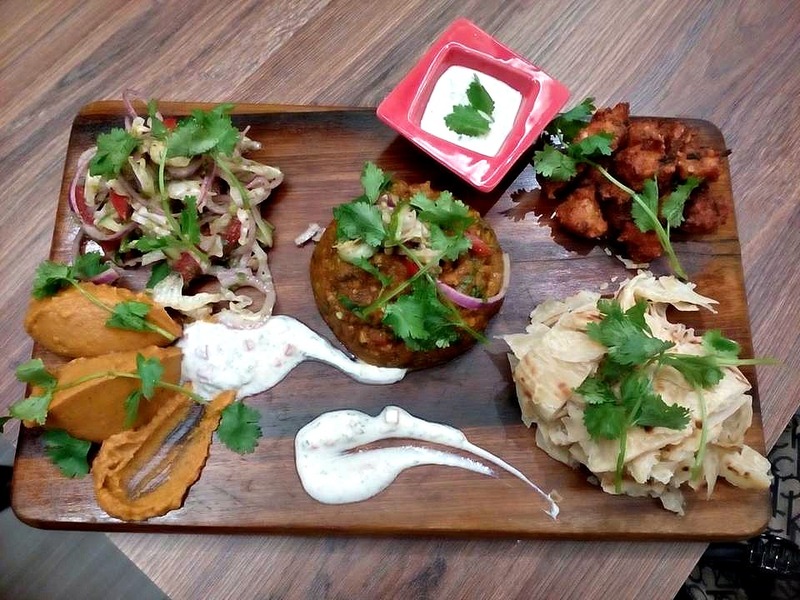 The Lachha Paratha, Baingan bharta, Kachumbar salad, chana masala flavoured hummus, Raita and Dal pakoras were a treat for people who loves indian flavours yet want to experiment. This is a fun dish that is ought to be shared over chitchat in the true Mezze style. The drinks brought in more element of surprise which were served in a chemistry lab inspired Florence flask with a a pink watermelon heart placed on top. not to mention the drinks were very refreshing. With competitive price, moderate portion sizes, great ambiance, good location, beautifully presented food and good innovative modern food Hakuna Matata ticks all the right boxes for us. 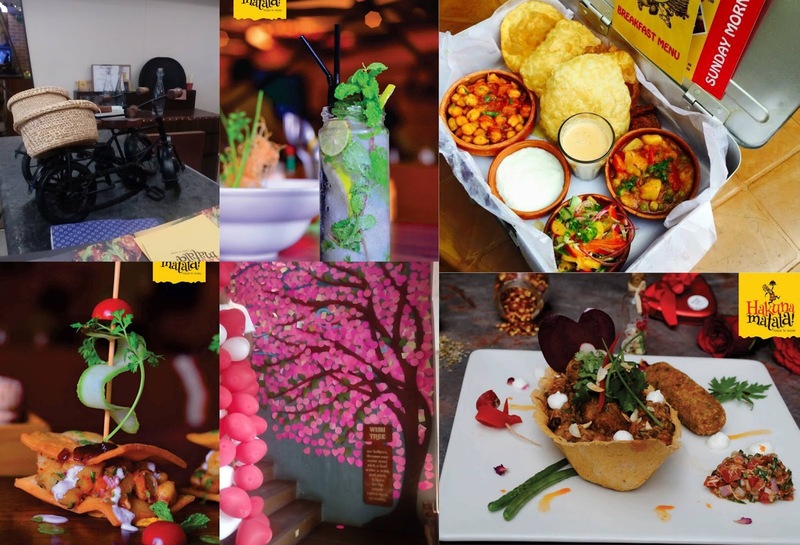 To know more give them a visit am sure the 'no worries for the rest of the day' mantra with good food will win you over.